WOLF PARADE - It probably goes without saying that - and well within expectations - that you're going to get a somewhat slanted presentation on independent media websites like ours. It's something that I try to combat actually, overcoming personal favorites to provide equal access to all quality music. I don't provide a lot of repeat exposures - with a few notable exceptions... Wolf Parade are my favorite contemporary act (and they have been for years now.) The wild tempo, the howling rock, the articulated madness - the exploration of sound... I'll come right out and admit it. I'm setting my professionalism aside. There's nothing I would rather do than to watch Dan Boeckner, Spencer Krug, Dante DeCaro and Arlen Thompson craft wild, frenetic songs up on a stage. It's 2010 and Wolf Parade is the Best Band in the World. 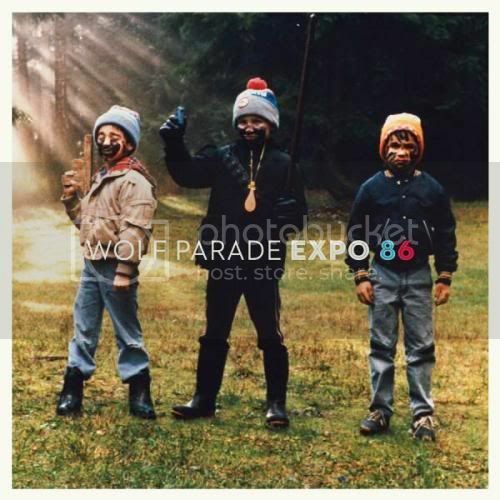 EXPO 86 - Following up At Mount Zoomer and Apologies to the Queen Mary, EXPO 86 is the new Wolf Parade album on Sub Pop. The album's 11 tracks were recorded and mixed at Hotel2Tango, withHoward Bilerman, earlier this year. The album title is clever in the fact that it is both memorable and autobiographical: the record is named for the World’s Fair in Vancouver in the summer of 1986, where five young boys first became friends, just outside the Cars of the Future exhibit. The kids made a secret pact to meet again in the far-flung future. Imagination begins here. Can I assume you will be at HOB tonight? as always well done sir! I'm selective of who I'll make the 2hr round trip commute for and I will not miss a chance to see this band.